On September 1, at 0500, the German Tenth Army of Army Group South crossed the Polish border and initiated the invasion of Poland. The German 31st Infantry Division, as well as 1st and 4th Panzer Divisions crossed the border in the operational sector of the Polish Volhynian cavalry brigade. After breaking through small detachments of the Border Guard and National Defence, the German units seized the towns of Krzepice and Starokrzepice, right in front of the main Polish positions. After capturing them, the Germans razed both towns and expelled all inhabitants towards the Polish lines. The German units were divided into three separate assault groups. The 1st Panzer Division headed directly towards the town of Kłobuck, held by the Polish 7th Infantry Division, while the 4th Panzer Division was split into northern and southern columns, each trying to outflank the Polish positions around Mokra. At the same time, the Luftwaffe started a heavy bombardment of the Polish positions. All together by the end of the day, German air raids arrived 15 times, with between 9 and 26 bombers each. The airplanes used were mostly Junkers Ju 87 Stuka dive bombers. At 0630 in the morning the motorcycle reconnaissance squads of the 4th Panzer Division made contact with the 12th company of the 84th Infantry Regiment under Stanisław Radajewicz. Soon afterwards the AFVs arrived, supported by infantry and purportedly using civilians as human shields. However, after several shots from the sides, the German tanks lost orientation, which allowed for the civilians to cross the Polish lines with negligible losses. The German assault was renewed shortly afterwards, but was repelled by heavy machine gun fire. Two AFVs retreated, while the majority of the motorcyclists were taken prisoner. The 4th Panzer Division then mounted an assault on the Polish 21st Uhlans Regiment, further northwards. After a short artillery barrage and aerial bombardment, the German tanks took the village of Wilkowieck and headed directly for the village of Mokra. However, although the regiment lost many horses and approximately five ammunition cars, the bombs mostly missed the defensive positions and the advancing tanks were welcomed at 150 metres by well-positioned Polish-made 37mm Bofors antitank guns. After two tanks were destroyed the German tanks withdrew at 400 metres and started shelling the Poles with artillery, but after losing an additional two AFVs (one destroyed and one immobilized), the tanks retreated. At the same time the German infantry was left alone on a flat field, right in front of the Polish positions, without any cover. It was forced to retreat by a Polish attack that caused heavy losses and resulted in a number of prisoners being taken by the Poles. The positions of the 19th Uhlans Regiment were attacked at 0800 by an assault group composed of tanks, AFVs, motorcyclists and infantry. 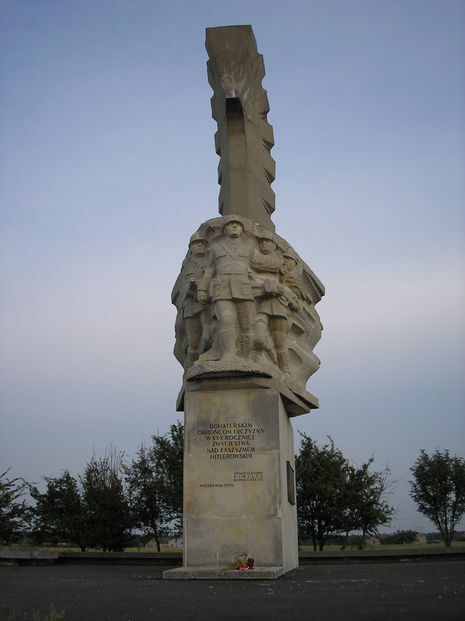 The German group, divided into three columns, was advancing towards the village of Rębielice Szlacheckie in order to outflank the 21st Regiment from the north. However, the Germans were apparently unaware of the 19th Regiment's positions. The westernmost group easily captured the village, while the central group was caught in an ambush by the Poles near the forest and had to flee the battlefield. The third group was advancing along the Polish positions in the forest, completely unaware of the Polish forces several hundred metres away. When the Polish machine guns and anti-tank guns opened fire, the group was almost annihilated before it could respond. 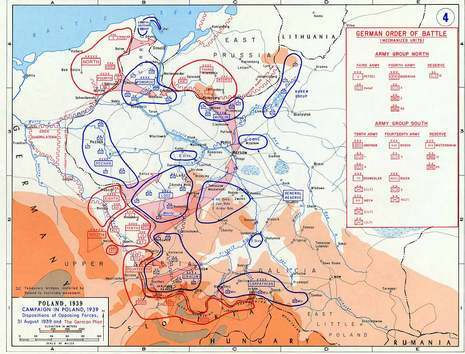 Nevertheless, the Polish northern flank was endangered and the Germans found out its positions. To counter the threat, Col. Filipowicz ordered the 12th Uhlans Regiment under Andrzej Kuczek, until then held in reserve, to strengthen the positions of the 19th Regiment. The newly-arrived units were fresh, yet already battle-hardened in the first skirmishes in the early morning, which seriously helped the Polish morale. The German 4th Panzer Division was forced back to its initial positions in Opatów and Wilkowiecko, and only the 12th Schützen Regiment managed to reach the rail road crossing at Izbiska. However, upon learning that the German 1st Panzer Division had managed to take Kłobuck, the Polish forces were withdrawn overnight south-eastwards, to the village of Łobodno located north-east of Kłobuck, and then to the second line of defence, some 12 km to the east.